Let us love each other for every beat of heart. Yoga Retreats with Lauren Lee are a true awakening of the heart. Lauren’s ability to hold a container of sacred space is immeasurable. From the moment I arrived on retreat with Lauren I felt an immediate sense of peace, as I was welcomed into a sacred circle and held by her wisdom and grace. I never questioned what I was doing or where I needed to be, as every moment was carefully crafted. Lauren offers space to dive deep into the soul and to be awakened into areas of yourself that have long been ignored. Each day I was nourished by a grounding vinyasa practice that moved me deep into the subtle body. Taking a week of relaxation and rejuvenation with Lauren Lee was the perfect reset for my life, providing me with clarity and wisdom for years to come. Through her teachings, Lauren radiates pure devotion for the path of yoga. She has a beautiful depth of knowledge as well as a passion for continuing to learn. Her classes are a graceful balance of foundational alignment and Bhakti spirit. Lauren is a heart inspiring Warrior Goddess! Lauren’s teaching is the highest combination of knowledge, beauty and grace that I have experienced. Her classes help you discover your body in a way that awakens the feminine qualities within and is wonderful for anyone (man or woman!) who wants to tap into this place. Lauren is dedicated to her own practice, therefor embodies the teaching and inspires those around her. My retreat with Lauren brought together a uniquely warm and open group of people in a space where I was able to explore my practice in an atmosphere of real magic. Lauren's teaching came at an important moment in my own teaching journey and allowed me for the first time to understand how to access my strength without forcing my body or overly engaging my mind! Her weaving of philosophy into her asana and pranayama teaching helps keep a beautiful sense of perspective and purpose to the practice. For me the retreat experience was both grounding and challenging, dynamic and soft and left me with a new-found confidence and direction that I will be eternally grateful for! Lauren creates an environment of realness in her classes, a place where you can onto the mat and expand into your body...to breathe and feel safe. She parallels the yoga experience on the mat with the human journey in the world. Bringing yoga philosophy, pranayama and alignment into each class, Lauren leaves you feeling loved, light and complete. She is passionate about sharing yoga on and off the mat as a way of life, and this shows in her teaching. Your first class or 500th, Lauren offers different options and modifications for all levels. 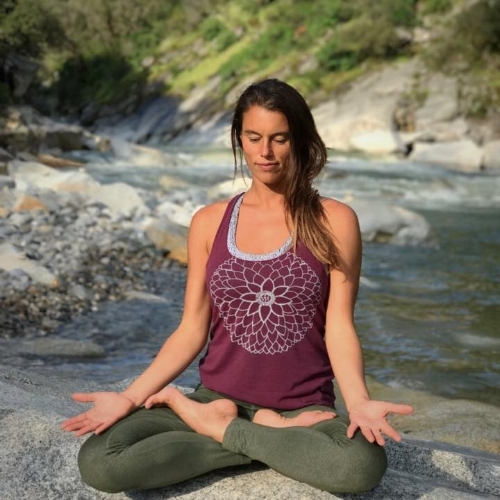 Diving into the spiritual practice of yoga and meditation, nature and the elements always play a part in Lauren's thoughtfully planned class. Motivating, beautiful and a true yoga experience. Lauren's teaching come from a place of integrity, deep spiritual learnings and practice. She perfectly blends the asanas with learnings, it feels like a complete and integrated experience that leaves you grounded, strong and lifted. She also holds a safe place for everybody and is able to cater to all levels with a loving vibe that permeates everything she does. I've had the immense pleasure of not only experience Lauren as a yoga teacher, but also as a business partner. Lauren is attentive, kind and fabulously talented as a teacher. She understands the everybody and every body is unique, and she strive to celebrate and honor every student. Lauren is continually traveling the globe to further her trainings, and openly shares her gained wisdom and perspective. Even more important, Lauren is compassionate, intuitive and driven as a partner and friend. Her standard of excellence is unrivaled, and I feel incredibly lucky to have her in my life, business and personal. Lauren is a teachers teacher. She has not only inspired and assisted me in deepening my physical practice, but has been a generous and supportive mentor through the years. Her classes are a beautiful blend of strong, dynamic movement within a supportive spiritual container. She has an unwavering sense of presence which seems to be infectious to her students. I always leave Lauren feeling grounded, securely in my body and inspired to take a leap into life's next adventure.